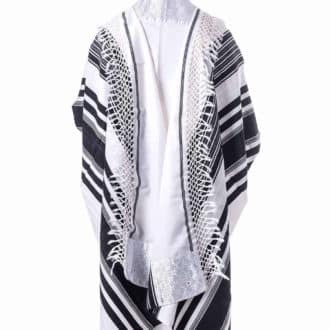 A modern, luxurious and unique prayer shawl made entirely of wool. 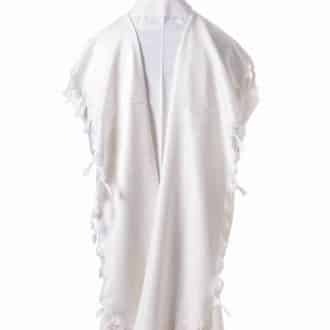 The Atara (the upper part of the prayer shawl) made of excellent quality, with the prayer shawl on it, the corners are decorated, the prayer shawl made of 100% wool. The Bnei or Wool Blue and Purple Stripes and Embroidered Alara Tallit Prayer Shawl is another product offered by Mishkan Ha Tchelet. This is one of the bolder colored options that people may enjoy when adding a stylish touch. The entire shawl consists of wool and feels great on the skin. Jewish people enjoy showing their dedication to God with these precious shawls. Good designers know how important this is. This Tallit beautifully made for this purpose. 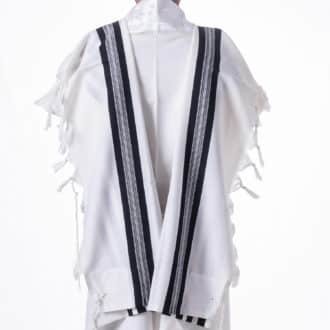 This Tallit is versatile enough for on both dressy and casual occasions. The addition of the color purple adds the touch of royalty to this particular piece. Many people wear their Tallit quite often, meaning that they need to be high quality to last. This one is a part of the collection made from the wool of ewes. There is no other fabric mixed in. It is also nice to have some variety when you are looking at purchasing a Tallit. Variety is available when customizing your Tallit with personally chosen tzitzit. There are many options for this prayer shawl. See the customizations below. The Stripes in light blue, blue and purple. Shipping and Refunds for "Bnei Or Tallit - Blue [Colorful Tallit Gadol]"